An interesting article by Rob Steen in Cricinfo states that among the 70 men who have led their country in 20 or more Tests lurk just two keepers (MS Dhoni, 53, and Andy Flower, 20); and Flower, the first to the landmark, did not enter the lists until the final decade of the last century. [how Sangakkara does not make the cut here is my Q ?] England and Australia have been notably resistant. Alec Stewart, whose 15 matches as a multi-tasker spanned nine years... perhaps there has been a prejudice ... in India as I could recall Ajit Wadekar, Pataudi, Venkatraghavan, Bishan Bedi, Sunil Gavaskar, Kapil Dev, Vengsarkar, Srikkanth, Azharuddin, Sachin Tendulkar, Sourav Ganguly, Dravid, Kumble – no wicket keeper till Mahendra Singh Dhoni catapulted to the top. Now comes the news that Denesh Ramdin, the West Indies wicketkeeper, has been named captain of the Test side and will take over from Darren Sammy, who will remain the T20 captain. This means West Indies have three separate captains for all three formats. Ramdin's first assignment will be the home series against New Zealand which begins on June 8. He has led the national side in three T20s and an ODI. Sammy tweeted welcoming Ramdin. One would recall this incident in the 3rd Test at Edgbaston in June 2012. Denesh Ramdin, the West Indies wicket-keeper, was fined 20% of his match fee after reaching his century. 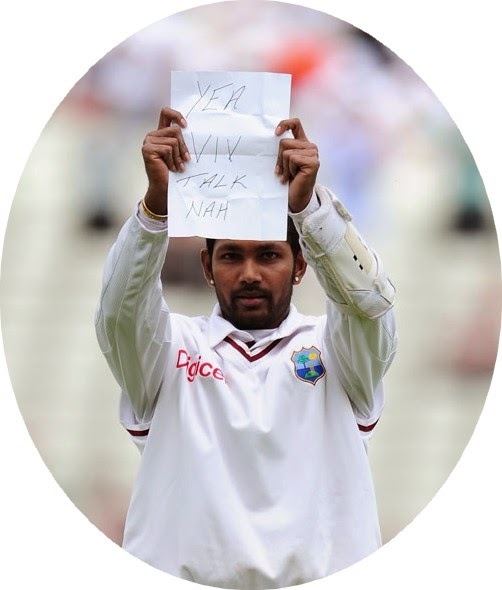 The ICC charged Ramdin with conduct contrary to the spirit of the game and he pleaded guilty to the offence. "We all understand the importance of celebrating a milestone, however, one should not use that time as an opportunity to hit out at one's critic or send messages to the world," Roshan Mahanama, the match referee, said. After the days' play, Ramdin revealed he had prepared the note earlier as a response to Richards' criticism of his deteriorating form after he had scored only 51 runs and kept wicket inconsistently in the first two Tests. Ramdin later admitted his reaction had been emotional.